Tijdens een privétour van 9 uur, combineer je bezoeken aan het Mutianyu-gedeelte van de Grote Muur en de Great Wall aan de Huanghucheng-waterkant met vervoer er tussenin. Berijd een kabelbaan of skilift naar de top van de muur en breng twee uur wandelen door, neem dan een rodelbaan naar beneden. Lunch en hotel pick-up en drop-off op de 4de ringweg van Beijing inbegrepen. Wees gereed voor een handige pick-up in je hotel in Beijing rond 8 uur, wanneer je je toegewijde gids ontmoet en klim in je privévoertuig. Leun achterover, ontspan en geniet van het landschap tijdens de 90 minuten durende rit naar het Mutianyu-gedeelte van de Grote Muur. Luister bij aankomst naar de introductie van je gids in het gebied en de geschiedenis van de muur en klim dan op een kabelbaan of een stoeltjeslift naar boven. Breng twee uur wandelen en verkennen, dan terug met de glijbaan, kabelbaan of stoeltjeslift. Maak een lunch in een lokaal restaurant voordat je naar Huanghuacheng Waterside Great Wall gaat, ongeveer een uur rijden. Dit rustige gedeelte biedt u de mogelijkheid om het omliggende meer te verkennen en deel te nemen aan enkele wateractiviteiten (optioneel). Kies ervoor om naar de top te klimmen, wat een uitdaging is maar de moeite waard, of bekijk de muur vanaf de oever van het meer. Deze privétour zorgt voor persoonlijke aandacht voor u en uw feest en voldoende tijd om vragen te stellen. Ga aan het einde van je tour terug naar je hotel voor aflevering. We had a great time visiting the Great Wall with Leo - the first section to Mutianyu was more renovated and catered to tourists, but not overly crowded despite being there on a Saturday. We had a great time taking the ski lift up and the toboggan down. After, we headed for a delicious lunch before heading to the Huanghuacheng section, which was easily our favorite part! Make sure you wear good shoes, because you are literally hiking up and climbing into the wall in this section. You could count the number of people visiting this section of the wall on your hands, and the views were breathtaking. We kept wanting to go further, and only our aching legs stopped us. Throughout the trip, Leo handled all ticket transactions and made sure we were well taken care of. It was an excellent trip and I wouldn't hesitate to book something else with Leo again! This private one day tour is fantastic. We enjoyed visiting two sections of the Great Wall. Becky, our tour guide, made the trip fun and memorable. 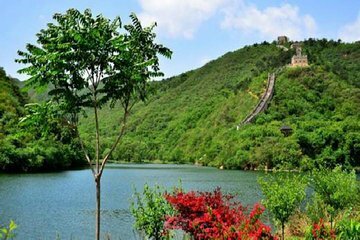 My suggestion is to spend more time at Huanghuacheng (the tour is flexible and allows you to pick how you'd like to spend your time). Highly recommend this tour. Our guide was Albert. He was very friendly and knowledgeable young guy. He arrived before the set time and collected us with his driver in a comfortable modern Buick minivan. Mutianyu was stunning and not so busy. Very easy to walk around. We were also blown away by Huanghuacheng. We walked clockwise around the lakes and a suspension bridge at the beginning was a bit dodgy but other than that is was a magnificent walk and we only saw one other couple. Place was deserted. The lunch was also wonderful. We went to a restaurant connected to a farm under a big glasshouse. Albert asked us what type of food we liked and ordered more than enough with lots of variety. It was one of the best Chinese meals weve had. This is an excellent full day tour. We were gone almost 9 hours all up. Beautiful place! I got to taste the grilled fish that is unique to the place at huanghuacheng. Enjoyed the tour! The visit at the two locations of the Great Wall was awesome. Our guide Albert was the best we ever had, very communicative, well educated, polite with perfect English and highly energetic. The lunch was local, tasty and way too much! Thank you Albert! Albert was a wonderful guide, very knowledgeable and helpful, answering our questions and then some, even giving us suggestions for things to do in the city. Mr. Jung was equally great. The two sections of the wall provided a different perspective, glad we did both. Highly recommend this tour. Fantastic trip to two beautiful areas of the Great Wall and lunch at a farm. I highly recommend the tour company, our tour guide Albert, and our driver Mr. Sun sp?. Tour date Sept 10 2017. Albert was wonderful and knowledgeable throughout the trip. During the drive out from Beijing, he told us much about the building of the wall and Chinese history at the time, very informative and great use of driving time. The first stop was at Mutianyu Great Wall, we took the gondola up to the wall after a short pause due to rain and had plenty of time to wander down the wall and back, stopping for photos all along. Gorgeous green mountain setting, with the wall visible in many directions. Then we drove to the farm for lunch, very good food and atmosphere, with house-made tofu. Albert ordered all the food for us, good selection and fun to try many different things. After lunch was a short stop at lakeside Huanghuacheng Great Wall. Beautiful setting with the wall coming down to the lake. Then back to our hotel in Beijing. Our driver took good care of us, getting us through a heavy rainstorm initially and all the Beijing traffic very easily. AMAZING TOUR. Albert and Mr. Jung or Jong were great. He was so informative and just a really fun guy. He did a great job of explaining things to us and even did the walk around the lake which none of his clients had ever wanted to do before! I have Celiac and he was also very helpful with getting me food at lunch that I could eat. We ended up seeing him two days later in Tiananmen Square and he came over and said hi. Out of the four tours we took he was our best guide!! We took this tour on Christmas day 2016, and it was AMAZING! We had a wonderful time! Our tour guide, Qing was fantastic! She provided us with more info/history than could have ever wanted. She even brought us little Christmas treats! We were at Mutianyu early enough to avoid the crowds that were arriving as we were leaving. The ski lift up and the toboggan down are not to be missed! The local lunch was amazing and delicious! We had more food than needed and were happy to take to go boxes home with us! The second site of Huanghuacheng was spectacular! We were the only people there! We were able to see the original untouched portion of the wall on the opposite mountain, and enjoy the preserved side to hike along. It was breath taking on Christmas day, I can only imagine how beautiful the area would be in the spring and summer!.... I would highly highly recommend this tour!